Part Info brings you reliable and up-to-date automotive technical information from the market's leading brands. Within the site you will find technical bulletins, COSHH/MSDS information, and a 'Knowledge Base' including technical articles and videos. Other features include ‘User Contributions’ where you can win a £10 Amazon voucher, ‘Ask the Experts’ technical support, interactive E-learning modules and a ‘technical support contact’ page. Within the ‘special features’ area you can sign up to Part Info to receive news updates and gain access to members only content, future competitions, incentives and giveaways. Thanks for visiting and we hope you find the site to be a useful resource. 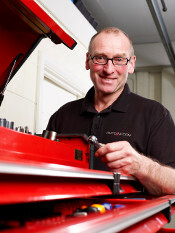 Frank Massey of ADS Ltd is one of the UK's leading vehicle diagnostic experts and says this about Part Info: "As an independent technician one of the greatest challenges with vehicle repair is access to reliable, quality technical information. This often takes the form of simple data but can and often extends to detailed information regarding procedure and special tools. No matter how much experience we may have, vehicle systems are evolving at a pace requiring all technicians to have access to a vehicle repair database. The Part Info technical website provides this information and has the added advantage of being fully supported by OE and Tier 1 manufacturers, as well as my full support." The advancement of engine technology is often the determinant of filter design in vehicles. Designed to recirculate a metered quantity of exhaust gas back into the combustion process, the EGR valve reduces the amount of oxygen entering the chamber. Rebuilding engines should always take place in a sanitary environment to avoid “building-in” dirt. Not all radiators are built the same. NRF explains the difference between brazed and mechanically assembled radiators.